In the past few weeks, we've unfortunately lost 3 of our flock. Well. Not exactly "lost". I found 2 of them. The first (and my favorite chicken, of course) just wandered off into the woods and never came back. She was fat, not particularly agile, and kind of dumb. But she was pretty (a silver gray dorking, for those interested). The second (a silver spangled Hamburg - pretty little hen all white with black spots. Kinda looked like a Dalmation slept with a chicken) disappeared one day, and I figured something similar had happened. She was always flying in and out of the coop. Then on Friday, my Bride called me to tell me that a third chicken was dead - she found its body on the floor of the coop next to the door. It had apparently broken its own neck, and been lying there since the morning. (Someone asked me how I knew that it had broken its own neck. I explained that it had left a tiny little note... "goodbye, cruel world..." That, and it had kind of clearly gotten its head stuck in the wire mesh where it fell. Silly chicken). It had also dropped an egg in its final moments. Hey. Waste not, want not, right? We ate the egg. I found that Dalmation-chicken later in the weekend, or what was left of her, at any rate. Her poor remains were in the coop, which was odd. My money is either on a hawk (though I haven't seen any hovering, and there's a tree that covers most of the run), or that the hens have gotten together to recreate Shirley Jackson's morbid short story, "The Lottery". We're counting the hens every day at this point. Dear Ms. Kelly - please forgive the Critter from school on Monday. I'll be taking her the slaughterhouse. 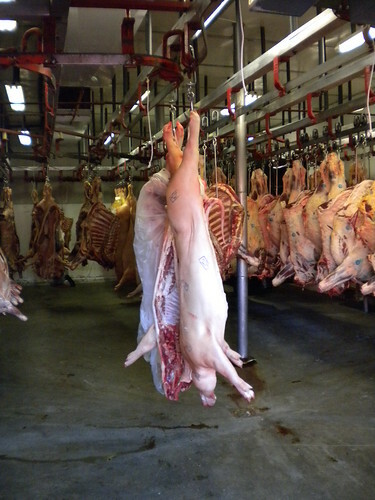 We bought two pigs recently, and as a part of our ongoing lessons in "where food really comes from", we'll be making a field trip to pick up and deliver them to the butcher. To her credit, the Critter was really cool about the whole thing. One of my semi-horrified colleagues said "you know, you might have ended up with a life-long vegetarian..." Yeah, maybe.. but not likely. I knew better. You have to know my kid, but she really likes her bacon. And when I came home late on Friday and had to deal with the suicidal chicken, I shrugged my jacket on and picked up a flashlight. I figured I'd just toss the body out into the woods, and let the fox or raccoons bring their own bucket. The Critter was mortified. "But daddy, we have to eat it!" 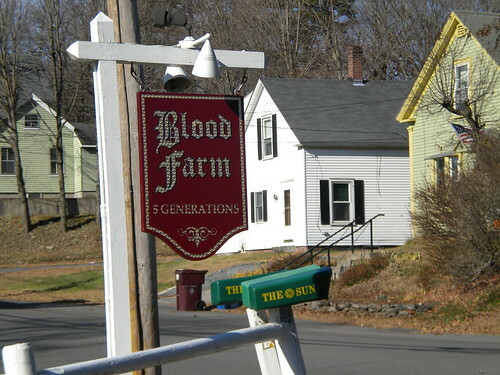 Monday morning, then, the kid & I drove out through the Massachusetts woods to the slaughterhouse, which (and I couldn't make this up if I tried) is named Blood Farm. Our two pigs had been delivered over the weekend, and were ready to go. The folks at the farm were super nice, letting me take pictures over their heads, and around their shoulders to get a good view of our pigs. I'm not sure how much they weighed coming in, but when we wrapped them up and prepped them to go, one weighed a hefty 230 pounds, and the other was a more svelte 210 pounds. Add that up, and you get 440 pounds of happy. Note: each one has been split longitudinally - I didn't know that was going to happen before I got there, but it makes sense. 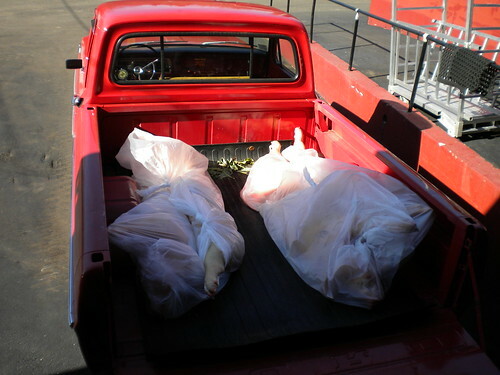 We threw these things in the back of the truck (don't know how to transport a pig carcass? Yeah, I didn't really think about it either. Fortunately, these guys are pros. They wrapped this stuff up in clear plastic and tossed it into the back for me). After an initial bit of "holy crap, I can see the inside of that pig" from both the Critter and myself, if I'm honest, we were fascinated. We poked a their teeth, and looked at the ribs, and saw how things were inter-connected. If she wasn't salivating so much, I'd have thought that we might be raising a next-generation veterinarian. She asked me which bits were made into sausage, which into sandwiches, and which into bacon. Also, she described it's skin as "ick". But that's only because she hasn't had it fried yet. With salt. The way God and every roadside stand along Georgia Highway 138 intended. 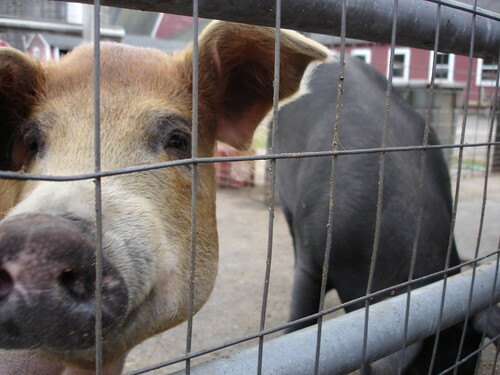 We moved our happy pig halves over to a butcher in Concord, MA (Hi, Mike! ), and he's slicing and cutting, chopping and grinding these lovely porkers into more recognizable cuts. And a few less recognizable pieces. He convinced me that "the jowls are good eating." ('Roast it with blood-orange juice, a bit of honey, vinegar, achiote and garlic...' See? It does sound good!) I've got an empty freezer and some hooks for hanging my hams in the wine cellar, anticipating the porky bounty. A buddy of mine from Siena, Italy brought me a fantastic book titled Preserving the Italian Way, with a whole chapter on meat. I've already got a chorizo recipe & a country sausage recipe ready to go, along with trying my hand at making bacon & pancetta from scratch. And to sell to my lucky friends and neighbors, I've got cuts coming of tenderloin, spare ribs, and 1.5" thick pork chops - I'm also going to make up "Grady BBQ packs" - pork shoulder, a bag of brown sugar rub, and a jar of home-made Carolina BBQ sauce, ready to go for those who want to make their families fall down on their faces in awe at dinner time, right there at the table, because it is just that good. I did the math with the Critter (always bringing it back to the practical application, to sort of justify keeping her out of school) - with my costs all in, assuming we'll get a bit more than 400lbs of meat (not much of it will be de-boned), even if we charged $3 a pound, selling off one pig's worth of meat will have paid for the costs for both. That's right, people. We worked ourselves into a whole pig's worth of free bacon. 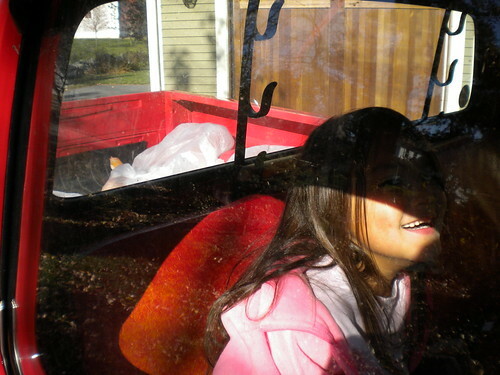 Just look at the expression on that child's face, with all that pig in the back of the truck. You cannot argue with the happy.